Bernie Sanders gives his "Where We Go From Here" Speech at a rally at Town Hall in New York City. Democratic presidential hopeful Bernie Sanders' campaign announced Wednesday it raised nearly $6 million during its first day of online fundraising, easily exceeding first-day totals amassed by his rivals. 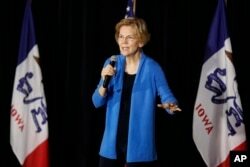 Sen. Elizabeth Warren, D-Mass., speaks to local residents during an organizing event, Feb. 10, 2019, in Cedar Rapids, Iowa. Sanders' show of strength is not surprising. He raised more than $200 million when he opposed Hillary Clinton in the 2016 presidential race. In its announcement Wednesday, the Sanders campaign touted a large grassroots donor base that includes individuals who have already "contributed $600,000 in donations that will recur every month."